Email the most powerful sales leads in human resources management: vice presidents of HR. A business contact and email database with all the contacts you need, our VP of HR email list is accurate and ready to download. Talk directly to the leaders of HR departments with this vice president of human resources email database from Bookyourdata.com. 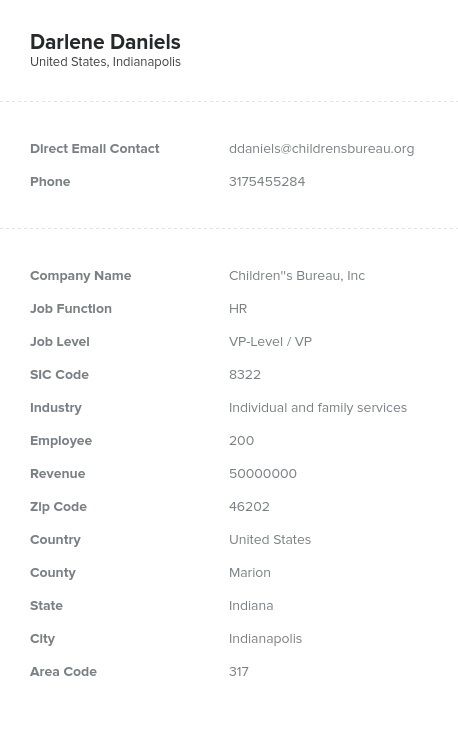 Our accurate data product will connect you with HR VPs and chiefs at numerous corporations, companies, and institutions by providing you with their human-verified contact information. This includes human resources vice presidents' email addresses, company information, direct postal addresses, phone numbers, and real names. Within moments of downloading this HR VP mailing list, you'll be able to pick up the phone and talk to these senior executives, email them as part of a powerful B2B marketing campaign, or send them direct mail. Get noticed by connecting with HR executives responsible for their company's human resources management decisions, from which services should be contracted out to what sort of HRM software their team should use to their organization's data-keeping methodology. If you have an HRM solution, why not reach the people at the top right away with our vice president of HR email database? Buy these high-quality, accurate B2B emails and go straight to the top of HR. This business contact list includes those with the specific job titles of HR leadership, such as "vice president human resources" or "chief human resources officer." Email lists organized by job title rather than industry or department will allow you to specifically connect with leadership. Download this list, flaunt your HRM solution, and make more sales today.